No matter where, when, or how you propose, you are going to adore our stunning selection of Engagement Rings. We have a style for everyone, whether you prefer classic, modern, solitaire, or vintage. A quick browse through our inventory will show you everything from intertwined bands to pave settings, with many choices for precious metals from platinum to rose gold. Solitaire, halo, vintage, and so much more await you. We even have specialized online tools to help you create your own custom engagement ring. You can read all the details about any ring that catches your eye, so you should get started now because we know you will love them all! One of the most important purchases of your life. The Symbol of your love and commitment.Whether you whisper your proposal in her ear or shout it from the rooftops, you'll want her diamond engagement ring to come from Intercontinental Jewelers. 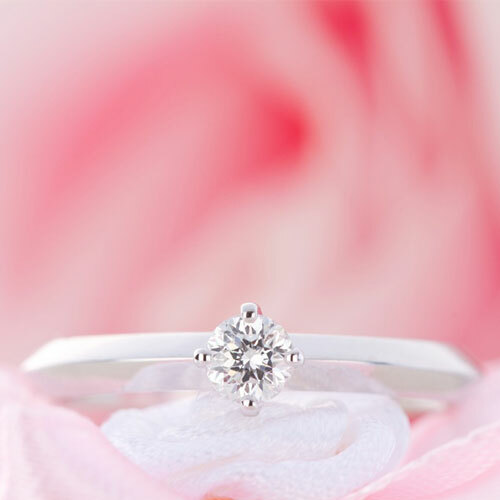 Let us assist you in selecting this most cherished symbol of your commitment and devotion. Whether she longs for an intertwined diamond engagement ring in 14K white gold or a halo cushion engagement ring in platinum, we offer all of these and so much more. We know you and your darling will be as inspired by our unbelievable selection as you are by your love for each other! Best Sellers Ready to Ship. You just knew when you had found her. You discovered so many of the extraordinary qualities and attributes you'd always desired, all captured in one person. Our stunning center diamond included engagement rings will have the same effect on you. Ready to ship and meticulously curated, Intercontinental Jewelers best-selling engagement rings with center stone included will dazzle you with their brilliance, and you’ll just know you have found "The One." Our diamond solitaire engagement rings stand out in a crowd and will wow you with their command solo performances. Prongs or bezel? Either way, our GIA certified diamonds always make a statement atop their simple but elegant bands of 14K white gold, rose gold, 14K yellow gold, or platinum. Standing alone, but definitely not lonely, our solitaires will find a happy home on the your beloved's finger. 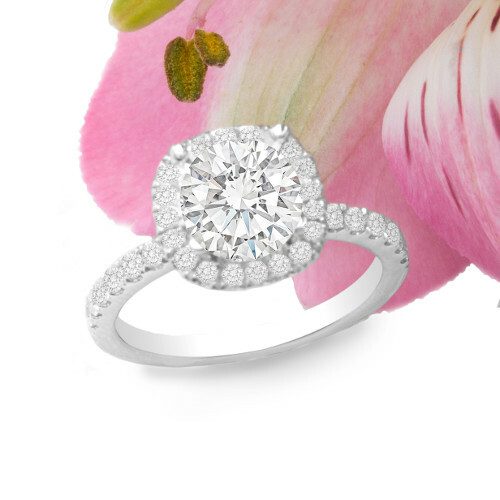 Our stunning halo engagement rings turn up the spotlight on her diamond. The halo dramatically enhances and amplifies her gorgeous diamond's appearance as if it is larger than life while still honoring its delicate beauty. The versatile halo can surround any diamond shape you desire, from cushion to emerald. Ah, now that’s heavenly! Heirloom Inspired Details. Let her channel her inner-Grace Kelly with a vintage engagement ring. She'll go gaga for our Art Deco, Gatsby, and antique style rings with their elegant swirls, geometric designs, and heirloom-inspired details. You'll help your sweetheart experience a different era just by slipping one of our vintage engagement rings on her finger. For Your Past, Present ,and Future. 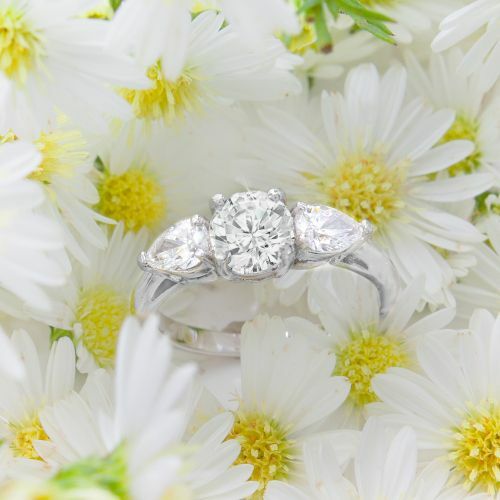 If good things come in threes, then our three-stone engagement rings certainly are a cause for celebrating your past, present, and future together. You'll swoon over our exclusive three-stone selections, including vintage, micropave, princess, halo, and pear diamond engagement rings. Our perfectly matched engagement ring-and-wedding band sets are a story for the ages. She will radiate joy as she looks upon the enduring quality and timeless design of the bridal set on her finger. With options galore such as braided, pave, or halo, our bridal sets are "better together," just like the two of you. A sapphire, yellow canary diamond, or colored gemstone engagement ring will saturate her world with color. Maybe your beloved is not a "Diamond Girl", but she always will shine brightly in one our vivid pieces. Your options for settings and styles are only limited by your imagination. Picture an intertwined 14K white gold band with a halo midnight blue sapphire. Oh, the endless possibilities! At Inter-Continental Jewelers, we are dedicated to making your diamond engagement ring selection process effortless and meaningful. Our professional team offers you expert guidance efficiently and quickly so you can find or have us create the ring of your dreams. We guarantee 100% customer satisfaction. 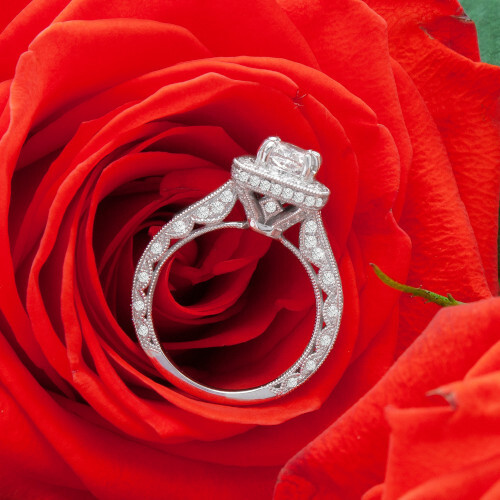 We are honored to serve you through each step of your love story, from engagement ring to wedding anniversary bands. Our center diamonds are GIA-certified and more, so they have the backing of the industry’s top grading labs. Plus, with the best prices and 6 months interest free financing, we know you’ll leave our store feeling confident that you will be proposing to your beloved with a truly swoon-worthy ring from one of Houston’s top diamond stores. Our vast selection of diamond engagement rings are eye-catching, unique and will leave you breathless. We offer a stunning collection of diamond engagement ring sets, diamond engagement rings with the center ring already included, the classic solitaire ring, three stone diamond engagement rings, pavé diamond engagement rings, halo diamond engagement rings, and a vintage-style collection of diamond engagement rings. And if that selection weren’t enough, you can have your ring made in platinum, 18k gold, 14k gold, or rose gold. While our pre-made options offer something special for everyone, if you happen to have a one-of-a-kind vision in mind, we happily will work with you to build your own custom diamond engagement ring. 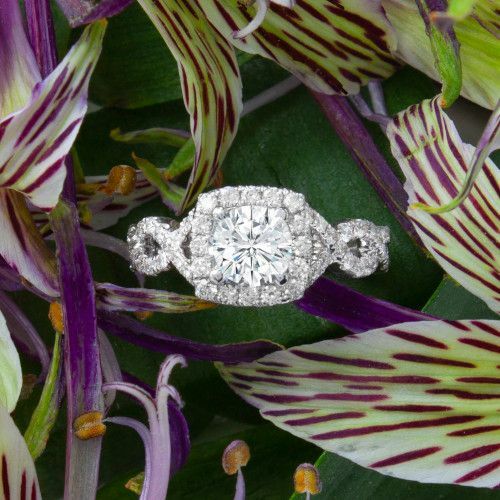 With our extensive selection of the highest-quality diamond engagement rings combined with our endless customization options available, we are convinced that the perfect ring awaits you here at Houston Inter-Continental Jewelers. With so many choices, you will want to read on to learn more about the various types of extraordinary diamond engagement rings you find at Inter-Continental Jewelers. Let the showcase begin! A singular sensation, our solitaire diamond engagement ring s convey a sense of timelessness, grace, and effortless beauty with its single diamond. The simple yet elegant band of this classic ring is all the accompaniment needed for this unforgettable solo performer. Our numerous styles of solitaire engagement rings boast varying cuts of diamonds such as princess cut, emerald cut, and the ever-popular round diamond solitaire. 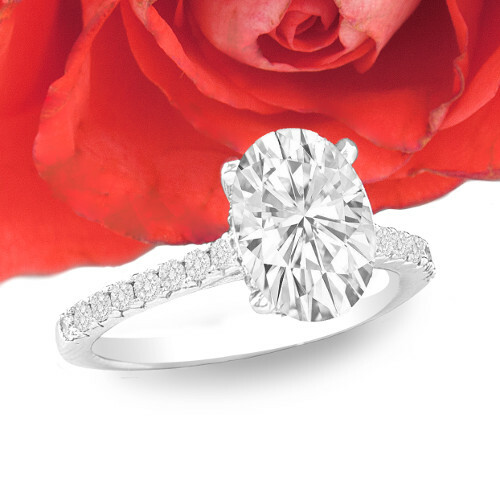 If you have your own diamond, Inter-Continental Jewelers will gladly set it in one of our solitaire engagement rings. Our engagement ring settings generally can accommodate diamonds that range from 0.50 carats to 5 carats. Prices start as low as $250. Our diamond engagement rings and sets are a must-have when your absolutely dazzling engagement ring calls for a matching life-long companion that complements it to a “T.” The quality and craftsmanship of our stunning diamond engagement rings and sets simply are the best. You’ll find our perfectly matched diamond bridal sets in many different styles from petite halo diamond wedding sets to incredibly ornate, pavé diamond wedding sets. In the twinkling of an eye, you just knew your darling was “it” in the space of a heartbeat! Our pre-set diamond engagement rings are just like that, meaning you’ll find a ready-to-ship, best-selling ring that instantly grabs your undivided attention.. Convenient and affordable for every budget, you and your love will delight in our assortment of breathtaking pre-set engagement rings. Get ready to fall in love at first sight all over again with our timeless styles, from simple diamond solitaire to exquisite halo designs. One stone to symbolize love, one stone for your friendship, and one stone for your life together. Our three-stone diamond engagement rings are a tangible representation of this beautiful sentiment that embraces your past, present and long-awaited future together. Whether a simple three stone setting or a pavé diamond accented setting draws your beloved’s gaze, a three stone diamond ring is one wayto emphasize that sparkly center diamond. With just one look, her heart will be open to the exquisite selection of three-stone rings that Inter-Continental Jewelers offers. Another popular and chic option for a center diamond that just pops with brilliance is the halo diamond ring. See for yourself how our selection of halo engagement rings stands out in any crowd. A frame of tiny diamonds enhances the look of your center diamond to appear larger than life and sparkling with fire and light.. Choose from our pavé diamond halos, double halos, cushion halos, princess halos, floral designs and more! Beautiful vintage designs currently are enjoying unmatched popularity. Many of our clients desire antique engagement rings that carry a special meaning and a timeless look. Our collection of vintage inspired diamond engagement rings fits the bill, evoking romance and elegance and recalling distant epochs. For a one-of-a-kind look inspired from a past era, explore our Vintage Collection and discover the ring you’ll want to grace your darling’s finger. With their filigrees, scrolls, geometric swirls, basket domes, and more, these antique-inspired rings are the perfect heirloom piece that will last for generations. Give her the sparkling effect of an endless sea of diamonds wrapped around her finger with the pavé diamond ring! Pavé settings contain diamonds that are set so closely together that no metal shows in between them. Our pavé engagement rings come in many diamond shapes and size options, so add some extra shimmer to her ring with a sparkling pavé halo, petite pavé, or double pavé engagement ring. If after meeting all of our bright stars, you still are looking for your muse, let us collaborate with you to build your own jewelry! You’ll be star-struck with happiness at the affordability of custom design diamond rings from Inter-Continental Jewelers. You get to select exactly what you want! You pick the size of the diamond, and you choose from our selection of 14K white gold, 14K yellow gold, 18K white gold, 18K yellow gold, or platinum for your precious metal. Our expert in-house designers handle any request, whether you would like an elegant, classic custom solitaire diamond ring or an exquisitely opulent pavé double halo princess diamond engagement ring. Our custom engagement ring creation is a breeze. Customizing your own ring is a mouse click away! Our Create Your Own Ring process is a fun and convenient way to personalize your own ring within the comfort of your own home. Simply choose your favorite diamond and preferred setting and and you'll be able to make your own engagement ring! We know you have many choices when it comes to shopping for the most stunning and elegant diamond rings in Houston. 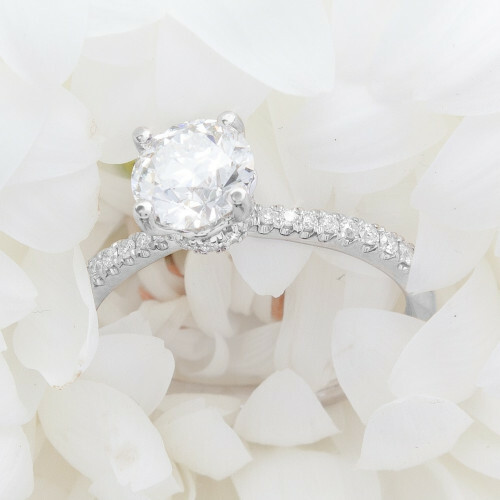 At Inter-Continental Jewelers, we will make you feel valued, confident, and exhilarated by our stellar service and our remarkable selection of engagement rings. 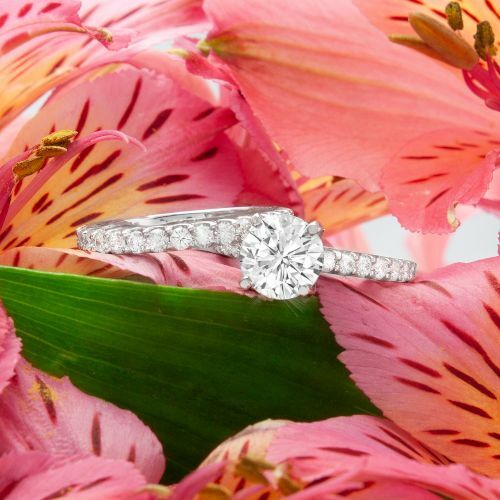 From antique engagement rings to our custom created wedding rings that let your imagination shine, your forever ring is waiting for you here at Inter-Continental Jewelers. We look forward to helping you during this exciting time in your life and throughout your endless love story.